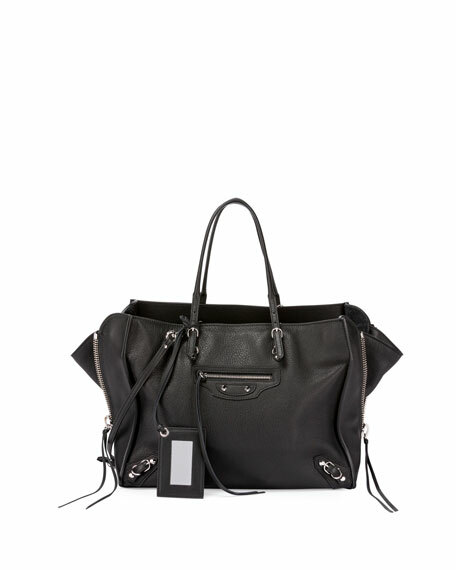 Balenciaga calfskin tote with nickel hardware, including stud and buckle detail. Rolled, buckled top handles, 5" drop. Removable, adjustable flat shoulder strap, 22" drop. Open top; concealed magnetic closure. Removable handing leather-frame hand mirror. Interior, calfskin lining; one slip pocket. 9.5"H x 12.8"W x 5"D; weighs 1 lb. 15.3 oz. "Papier B4 AJ" is made in Italy. 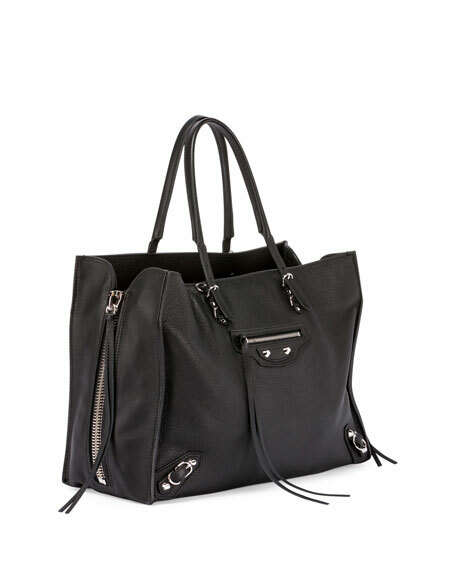 Marc Jacobs colorblock coated saffiano leather tote bag with polyurethane coating. Rolled top handles with hanging padlock and covered key. Marc Jacobs saffiano split cow leather tote bag with polyurethane coating. Rolled top handles with hanging padlock and logo tag.